Lon Jefferies, a Certified Financial Planner™ (CFP), is a fee-only financial advisor and trusted fiduciary at Net Worth Advisory Group in Salt Lake City, Utah. He is dedicated to providing comprehensive financial planning and investment management on a fee-only basis. Am I going to be able to retire by the age I have targeted? Can I afford to retire early? Once I retire, will I be able to maintain my current standard of living? If something happens to me, will there be enough money to take care of my spouse, children, and parents? What if I live longer than I anticipate? Will I have enough money to support myself? Can I afford to contribute to my favorite charities? Can I pay for my child's education? My grandchild? Can I afford to start my own business? Do I have the ability to take my family on an extended vacation? Will I be able to pass my home on to my children? Can I afford to leave my job to pursue something I am passionate about? Of course, this is but a small sample of the type of questions people may have, but the point of each question is really "can I afford to live the life I envision." Interestingly, notice that none of these questions have anything to do with achieving a high rate of return, or what the next hot stock will be. Thus, the true purpose of financial planning is determining how we can live the life we desire, not how to maximize our investment accounts. Contact me today to schedule a complimentary consultation. Watch now to learn what to look for when hiring a financial advisor. View this video to learn how working with the right advisor can get you closer to your financial goals. 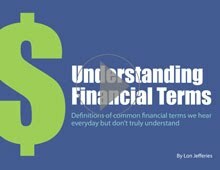 Definitions of common financial terms we hear everyday but don’t truly understand. How Is Net Worth Different? Our fee-only system allows the client's interests to be top priority. We are never paid commissions so we have no conflicts of interest. We accept a fiduciary responsibility to always act in the best interest of our clients, unlike most advisors who only commit to not harm clients. Our comprehensive approach examines investments, tax, insurance, and estate details. We work with our clients to create an investment policy specifically for their needs, time frame and risk tolerance. We provide superior on-going service to our clients. We are ALWAYS on call to address questions and concerns.